Decoupage is the art of cutting and pasting pictures onto objects, then coating them with a layer of varnish, lacquer, or decoupage medium. Crafters often decoupage bottles, boxes, and furniture with cut pictures, giving the objects the appearance of being finely painted. Decoupage is easy to learn, and most people get excellent results with their first project. Do you have any chairs in your home that have seen better days but are structurally sound? Why not give them a second life by improving their appearance with pretty decoupage paper cutouts and paint. You will have rejuvenated furniture in almost no time, that you will be proud to display in your home. The following examples of decoupaged chairs are lovely sources of inspirational ideas that will help you achieve beautiful results with your next chair renovation project. Almost everyone has some inexpensive plastic garden chairs in their backyard or garage. Freshen them up for the next season by gluing paper circles cut from Ikea napkins. No one will guess the source of your chair upgrade. Since these chairs stay outside most of the time, be sure to coat them with boat varnish. This type of varnish will help protect your decoupage art from the elements. Eames style plastic chairs have been around since the early fifties. They are proof that good design is timeless! If you have some knock-off Eames style chairs that you want to change, cover them with decoupaged marbled fabric for an upscale, unique look. Give your child an exclusive chair that is theirs alone. Paint a child-sized chair white and then decoupage it with scanned booked covers of your child's favorite books. Your boy or girl will love their unique reading chair made just for them! 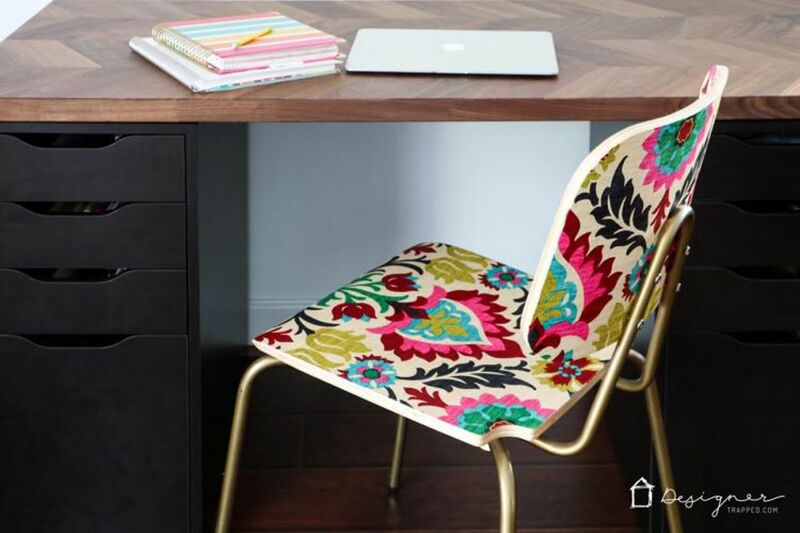 Cover a wooden chair with brightly colored, tastefully designed upholstery fabric to transform it into an office chair you will love. This tip is excellent for those that are short on money and would like to mimic the look of high end upholstered chairs. 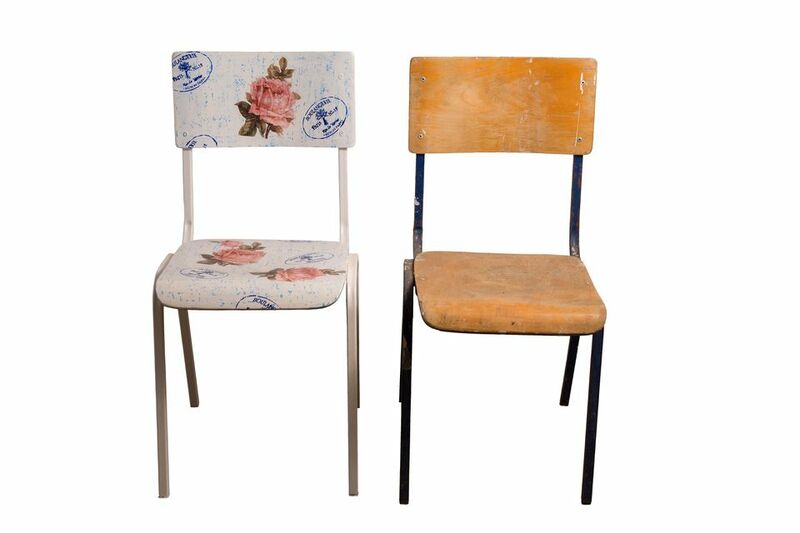 Add a bit of fun to an old office chair by covering parts of it with quirky wallpaper. It will instantly improve the look of your chair and add some style to your office. Sometimes you can give old chairs some pizzazz by decoupaging designer fabric onto their surfaces. We think these chairs are fabulous! The chairs were covered with fabric designed by Orla Kiely, a prominent Irish fashion designer. Elegantly transform an old beat-up, out-of-style chair with black paint. Then decoupage dotted circle fabric pieces onto the seat and chair back to give it some pop. Your old chair is new and beautiful again. Mark Montano changes an ordinary wooden chair into a homage to the artist Fornasetti. This tutorial includes easy-to-follow step-by-step photos, plus an informative video. You will have Fornasetti knockoffs in no time! Inexpensive Ikea chairs can be transformed into elegant pieces of furniture with a little bit of paint and decoupage. The moss green background and subtle gold metallic pattern make this a standout piece of furniture. No one will ever guess this chair came from the Swedish big box store! If you are a fan of travel, decoupaging a chair with a map might make a cute addition to the rest of your furniture. It is a sweet reminder of past experiences or inspiration for your next adventure!